What Shipping Costs Can I Expect for My Order? Modalyst has set a maximum cost per country/region for shipping rates. This means that the rate will never exceed the stated amounts below. However, if a supplier wants to offer a lower shipping rate, they are able to adjust the rate down. Essentially, domestic rates are priced at $5 or less. International rates are priced $15 or less. When you view a product on Modalyst, the shipping cost will be automatically calculated based on where you are located so that you have an understanding of what you will owe the Supplier when it is time for payment. 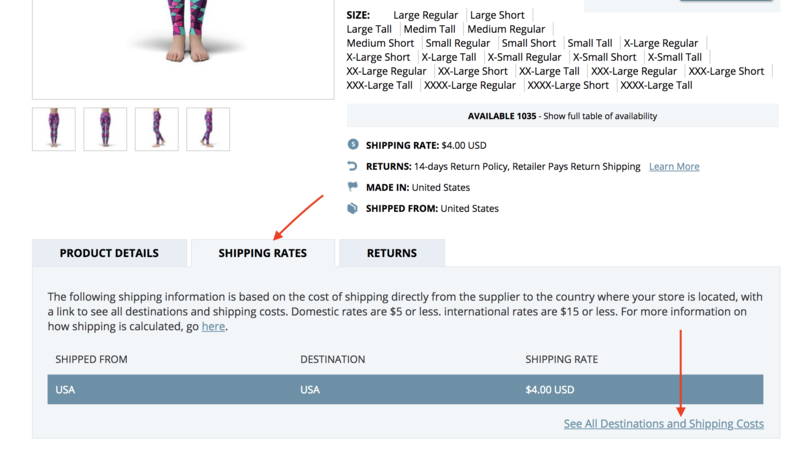 You can see the shipping cost associated with a product under the "Shipping Rates" tab in each Item Detail page. Please note that not all Suppliers ship to all regions. Please click on "See All Destinations and Shipping Costs" to see more information. If a Supplier is NOT shipping to a particular region, please be aware that if you receive an order from a customer located in that region, they may not be able to fulfill it. Please see more information about this here.